I was back in Bryn Mawr for work and when I said that I was heading into Manayunk to get some wings, Dave suggested that there was only one place I needed to go – Union Jack’s Pub. Union Jack’s is known in the area for having great wings, and with a sign on the outside wall that says “World’s Best Wings,” they must know what they’re doing as that’s a big claim to fill. I parallel parked my car on a hill into a tight spot (which by the way is hard to do with a manual), and walked into this small dive of a place. I was the only patron in the joint, but the two gentlemen who worked there made me feel right at home with some small talk and a beer. I took a look at the menu and decided to get the 10 count of Hot at the suggestion of the bartender, but opted out of getting the celery and blue cheese due to the fact that they cost extra and I don’t really care to waste money on something I’m not going to eat anyway. They also carried a Mild, Medium, and a Suicidal (which I grabbed a side of to see if it really made me want to kill myself). After the order was placed, the bartender prepped my area with a paper plate and extra napkins, which shows that he understood the needs of a wing-eater, such as yours truly. When the wings arrived they looked like any average wing that I would expect to find: Red in color, simple in nature, and with a smell that made my mouth water. 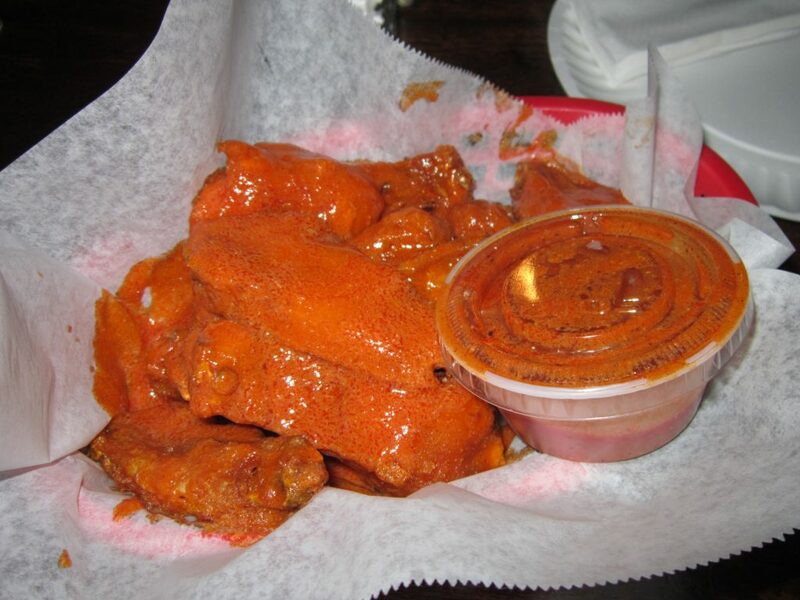 The very first bite screamed Frank’s, however, after drowning the wings in a puddle of sauce, I could taste that they added their own spices and flare to give it more of a unique flavor. I love when a place doesn’t just use bottled sauce, so this was a nice turn of events from my initial bite. The wings themselves were nothing fancy and offered a weird irregularity in size. The pieces were pretty large which is great, but it seemed that only the drums were huge while the wings were a normal size. Either way, I liked the fact that this meal could fill me and not leave me wanting more (and I’m glad ’cause the side of fries that I also ordered just for that reason were inedible… but lucky for me, that’s not why I came). The sauce had a great heat to it, and I’m glad I went with the bartender’s recommendation, although being so hot it left me curious as to how hot the Medium was. The only question that I didn’t need answered was how hot the Suicide was because there it was, right in front of me, begging for a go. I cracked it opened, poured it on the last piece, and took a big bite. The Suicide forced me to have more heat, and forced me to eat more black pepper, but did not force me to take my life. It was just like the other sauce – good to eat, but not really memorable. All in all, Union Jack’s was a fun little place with nice people and wings that made me happy. Would I consider them best in the world? Clearly not. Best in Pennsylvania? Eh. Best in Manayunk? Maybe. Needless to say, they still fulfilled my wing craving better than the average bar could. So if you find yourself in that area, feel free to try them for yourself… but make sure you bring cash or you will find yourself taking a two city block hike to the ATM to pay for these babies (Not that I know from experience or anything).